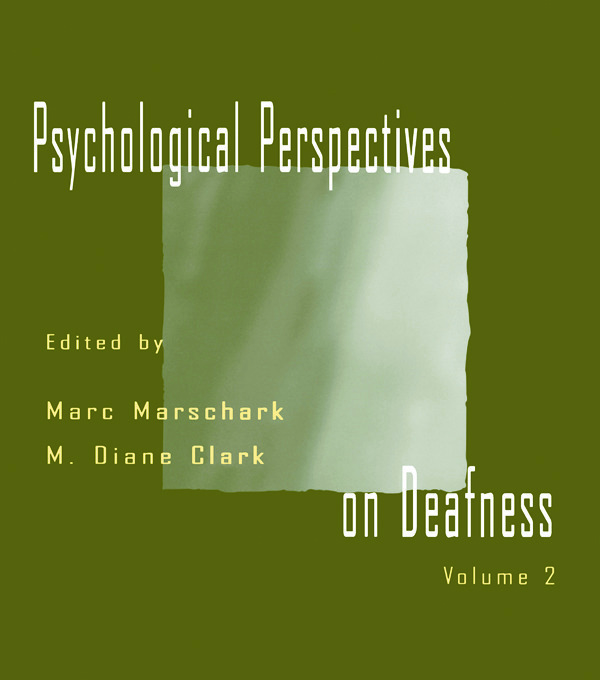 This edited volume picks up where Psychological Perspectives on Deafness, Volume 1 ended. Composed of review chapters that reflect cutting-edge views from well-known international researchers within the field, this book surveys issues within the field of deafness, such as cognition, learning disabilities, social development, language development, and psychopathology. It also highlights the many new and exciting findings currently emerging from researchers across a variety of disciplines--psychology, education, linguistics, and child development. The chapters will engage, challenge, and lead the field on to productive empirical and theoretical work relating to the broad range of questions which concern the psychological perspectives on deafness. "Concepts in Composition should appeal to faculty who-as I have done for years-work with first-year teaching assistants….A book such as Irene Clark's can help these and other new teachers of college composition by engaging them in the concepts and topics that define our important work with undergraduate students." Contents: Preface. W.C. Stokoe, A Very Long Perspective. K. Emmorey, The Impact of Sign Language Use on Visuospatial Cognition. M. Marschark, T.S. Mayer, Mental Representation and Memory in Deaf Adults and Children. C. Courtin, A-M. Merlot, Development of Theories of Mind in Deaf Children. J. Leybaert, Effects of Phonetically Augmented Lipspeech on the Development of Phonological Representations in Deaf Children. P.E. Spencer, J.C. Hafer, Play as "Window" and "Room": Assessing and Supporting the Cognitive and Linguistic Development of Deaf Infants and Young Children. S. Gregory, Deaf Young People: Aspects of Family and Social Life. R.Q. Pollard, Jr.Psychopathology. V.J. Samar, I. Parasnis, G.P. Berent, Learning Disabilities, Attention Deficit Disorders, and Deafness. J.M. Bebko, E.E. McKinnon, Assessing Pragmatic Language Skills in Deaf Children: The Language Proficiency Profile. C.T. Akamatsu, C. Musselman, Development and Use of a Conversational Proficiency Interview With Deaf Adolescents. M.D. Clark, A Hitchhiker's Guide to Holes and Dark Spots: Some Missing Perspectives in the Psychology of Deafness.